We are investing in our church facilities in order to remove the physical barriers to participating in our church life, and so that we might start new ministries and outreach. We are in the midst of a 3 year Capital Appeal to raise $600,000 for building renovations such as an elevator, ADA restrooms, expanded musicians area, family/youth space, and offices. Our current facility is a barrier to our welcoming spirit, our desire to deepen our connections with each other through study and fellowship, and to developing ministries that serve our surrounding neighbors. Our church has five levels only accessible by stairs, and there is only one accessible bathroom for people with limited mobility. The fellowship hall, kitchen, classrooms, preschool, and offices are very difficult, unsafe, and sometimes impossible for those with limited mobility to access. People either choose not to attend events (Bible Study, Smorgasbord, funeral receptions), or they need to be carried up and down the stairs. Our facilities’ inaccessibility limits the number of church and community groups that can meet at our church at the same time. 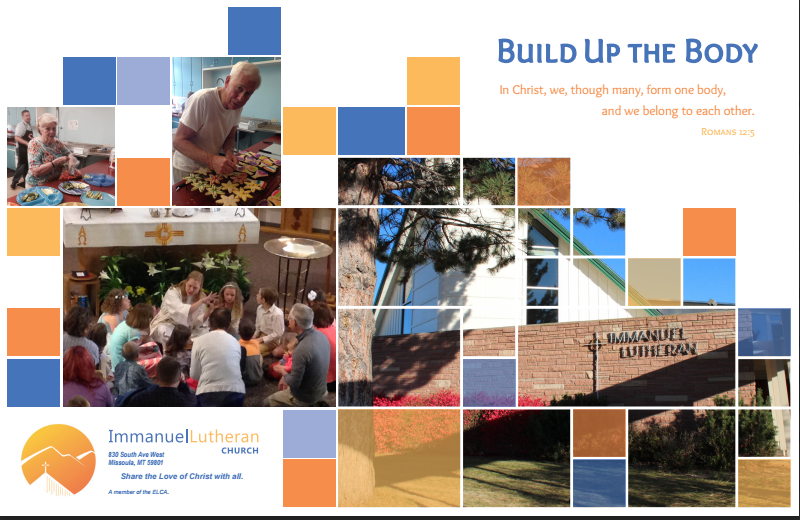 Our vision is to Build Up the Body at Immanuel Lutheran Church by creating a place where everyone feels welcome, and where everyone can participate in the mission and ministries of our congregation. Our vision is to extend hospitality to friends and strangers. Our vision is to affirm our unique gifts as individuals and our unique calling as the collective Body of Christ at Immanuel. Our vision is to uphold our desire to care for and honor each other as beloved and important parts of the Body of Christ. Architect’s vision of changes to building. 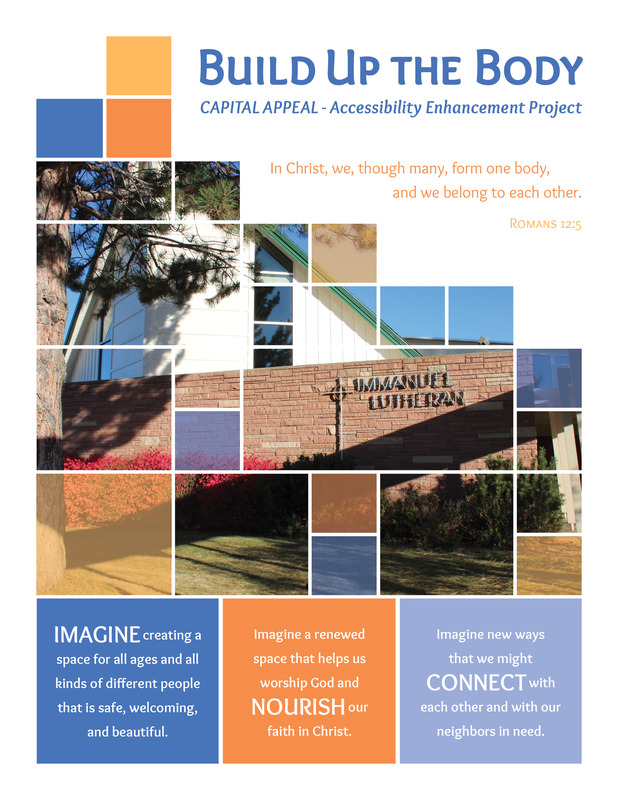 In January 2016, our congregation voted unanimously to enact this vision through pursuing and funding the Accessibility Enhancement Project. The goal of the project is to raise $600,000 over three years to make building improvements that will include adding an elevator to unite the five levels, adding six accessible bathrooms and reworking spaces to be more inviting. The Build Up the Body vision is truly about living out our church’s mission “to share the love of Christ with ALL. The Build Up the Body vision affirms our belief that in Christ, we belong to each other. The people of God at Immanuel Lutheran Church again and again have re-imagined and re-invested in our people and our church building so that we can reach new generations with the good news that through God’s unconditional love, forgiveness, and grace, we all belong to Jesus Christ, and we are all part of His Risen and Living Body in the world today. As Christ gave His body for us, so we, His disciples, give ourselves, our time, and our possessions for others. It is a joy and privilege to share the gifts that God has given us. Imagine the joy to come as we join together and give generously together, making sure that Immanuel is welcoming and accessible to all, so that all may know and believe that they belong to Jesus Christ, and through Him, to one another. Thanks be to God for this opportunity. How can I give to the Capital Appeal? Capital Appeal gifts are above and beyond people’s regular monthly giving to the Four Pillars of Annual Ministry. Usually, people give to the Capital Appeal out of accumulated resources such as stocks, bonds, pieces of property, savings accounts, insurance policies, charitable remainder trusts, mandatory retirement distributions, or inheritances. Some choose give a percentage of their monthly income to the Capital Appeal. Click the button below to make a one-time or reoccuring donation.